A range of factors can contribute to erratic performance. By David S. Dickey, MixTech, Inc.
Varying results from seemingly repetitive processes afflict many plants. Indeed, as a consultant for mixing processes and equipment, I find that a large proportion of my projects involve tackling such issues. Companies call upon me because they think that at least part of their problems relate to mixing. In most cases, the difficulties result from not paying enough attention to the process and, sometimes, just from inadequate attention to the details. Some inconsistencies become obvious with careful observation of the entire process from the raw materials to the product and even packaging. However, some mixing problems may be more difficult to assess and correct. Everyone knows something about mixing. After all, it plays a role in preparing meals in the kitchen and in performing some do-it-yourself household projects like painting. However, this familiarity sometimes hinders rather than helps. For instance, duplicating what happens in a kitchen mixing bowl or a laboratory beaker can be difficult on an industrial scale just because of size. Indeed, some industrial mixing problems develop simply because of the increased batch size. Mixing several thousand gallons or pounds of material is tougher than a similar operation in a kitchen mixing bowl. In other cases, the products being mixed may have different components, some with unusual physical properties. Even food ingredients can cause process problems on the industrial scale. Most mixing inconsistencies stem from one underlying misconception. Mixing isn’t just one process and can’t always be done successfully in one way or by one type of equipment. Creating an oil-in-water emulsion requires different mixing functions than those for suspending solids. Heat transfer varies considerably depending on the service, e.g., blending versus gas dispersion. Correctly identifying the type of mixing process and the most appropriate equipment is an essential step in creating a consistently successful mixing process. To succeed, at a minimum a mixing process must ensure that all the vessel contents are moving. Whether the process is low viscosity blending, high viscosity turnover, solids suspension or gas dispersion, everything must be in motion to achieve a practical degree of uniformity. Increased uniformity is the most common characteristic that defines mixing, regardless of process details or the phases present. Even dry powder blending has greater uniformity as its primary objective. A sufficient degree of uniformity for powders is a random or chaotic distribution of different particles. Liquid blending often is the simplest and easiest mixing process to define and monitor. Whether combining large quantities of a few materials or adding many ingredients to create a batch, mixing usually is measured both by the degree of uniformity and the time required to achieve that result. When two or more components have similar physical properties achieving a uniform combination generally doesn’t pose great difficulty. However, if one component differs significantly in a physical property, e.g., viscosity, even miscible liquid blending can take a long time and require intense mixing. Adding the more viscous liquid to the less viscous one almost always works better than doing the opposite. The lower viscosity liquid is easier to move and even may be turbulent enough to help disperse the higher viscosity addition. Putting a low viscosity liquid into a high viscosity fluid can be extremely difficult. The flow pattern in a high viscosity liquid often is laminar with stretching flow that only creates streaks or sheets of the low viscosity fluid. It may take a considerable amount of time to divide and stretch the low viscosity liquid well enough to achieve an acceptable blend. A mixer often is the main piece of equipment that helps transform raw materials into a product. The success of that process step depends on both the raw materials and the equipment. First, to have any hope of making a quality product, sufficiently consistent raw materials are essential. The raw materials most likely to cause problems are natural ones, whether minerals or agricultural products. Minerals taken from the ground can differ in physical or chemical properties depending upon their origin, even within a single deposit or mine. When the minerals are refined before use, differences in properties still may exist; these can change the ability of a mixer to produce the desired product. Agricultural products also may vary in properties because of moisture content, growing conditions or other factors. Manufactured compounds typically are less variable. Eliminating differences in batches of raw materials obviously is important to avoid product inconsistencies. At the most fundamental level, a plant must purchase components to the same specifications and test them to ensure compliance with those specifications. For some ingredients, achieving consistent processing and product quality requires meeting tight specifications. In other cases, a relatively wide range of physical and chemical parameters may be acceptable. If material specifications can’t be assured, the site must have a mixing process sufficiently robust to handle the variability. Depending on the type of process, everything from chemical purity to particle size or viscosity may be an important property. One of the more common problems is an inconsistent starting temperature. If a process doesn’t begin at the same temperature for each run, the fluid viscosity or reaction rate may differ. Unfortunately, initial temperature often varies highly depending on time of day, day of the week, operator observation, ambient temperature, etc. In one case I encountered, a plant always heated a batch of polymer before starting the process but gave its operators no instructions as to how high or low the temperature should be. The process began when the operator was ready — so, the temperature differed from batch to batch. Even when measurement of ingredients is accurate, order of addition or rate of addition can significantly affect process results. Operator training or other methods can minimize addition variability. One way to regulate the rate of addition is to put in a measured quantity of an ingredient and then mix for a certain period before making another addition. The amount of time between additions must be long enough to avoid large differences in local concentrations. Another problem area, not directly related to mixing, is post-processing and packaging. For instance, the plant that had difficulties with initial batch temperature also incurred issues because it processed the finished polymer on different pieces of equipment. Although the final products looked the same, the actual processing differed with respect to the steps in the rolling and cutting operations. Regardless of the methods used to regulate a process, one of the best controls is accurate recordkeeping. Proper batch records not only promote good operating procedures but also can serve as a key tool for tracing possible causes of variations. Some inconsistencies are as basic as differences in operator training or experience. Certain operators can improve a process while others seem to introduce new problems in every batch they make. The same plant that didn’t monitor starting temperatures or post-processing equipment also lumped daily production into a single lot number. Each day, it produced five to ten batches, most at slightly different conditions. Lack of individual lot numbers for these batches significantly hampered finding a cause and solution to inconsistency problems. Another common misconception is that good mixing requires a deep surface vortex. In most cases, a deep vortex actually results in poor mixing because all the flow is around in a circle with little vertical or radial motion. Baffles help convert some rotational motion created by a center-mounted mixer into both vertical or radial flow. (For more on baffles, see “Don’t Let Baffles Baffle You.”) Vertical recirculation usually is the most effective means for creating a uniform blend or suspending solids. Without adequate vertical motion, ingredients added on the surface may take a long time to reach the impeller and circulate throughout the entire tank. Even when a surface vortex may aid in liquid or powder addition, the vortex never should extend all the way to the impeller. Once the impeller begins to draw air into the liquid, pumping dies and mechanical loads on the mixer increase. A deep vortex in a laboratory beaker may work because of short distances and times — but still isn’t efficient. Observation is key to quantifying and understanding mixing. That’s because all mixing results are empirical. While correlations permit accurately estimating impeller power and pumping, these correlations come from data obtained in experimental studies. Other characteristics of mixer performance require more direct monitoring. Indeed, determining suitable process improvements depends on good observations of existing conditions. Mixing sometimes gets blamed for process problems because it’s the least well understood operation. Almost anyone can identify good mixing in the kitchen and other household projects. The problems in industrial mixing are much more difficult to observe. Factors like tank size, metal construction and opaque fluids sometimes make direct monitoring nearly impossible. The first step in making process observations is to quantify product quality. Focusing on product quality directs the critical observations of the process at what the customer sees. Quality control tests should exist both for the product and the raw materials. The basic observations before and after the mixing operations must be quantified and verified. 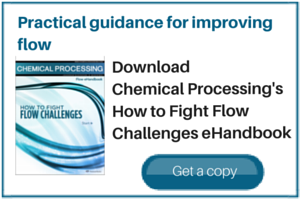 To the extent practical, seek laboratory or pilot plant data, even if from previous testing. A process or test failure may provide the most important information; unfortunately, such mishaps often don’t get recorded and evaluated. In many mixing applications, simply avoiding previous mistakes or unsuccessful operating conditions can solve process problems. Identifying changes in the process or ingredients that correspond to the product inconsistency problems may require documented conditions over a period of time. A key step in making process improvements or avoiding problems is obtaining objective data about the problem. Whenever possible, delve into the type of mixing necessary for success of the operation. Simple blending always is necessary — but may be needed primarily for batch uniformity of composition, viscosity, temperature or other chemical and physical properties. Mixing has been around for a long time and studied extensively. Numerous books and papers present useful information about solving mixing problems. A lot of practical advice appears in the mixing section of CP’s online Ask the Experts Forum. Even a basic Internet search may lead to a source of information that can provide guidance about possible improvements. In the absence of a clear connection between the process and result, the next option may be to select an adjustment to the process with a high likelihood of success and a low probably of failure. A reduction in batch volume of 10% to 15% should raise mixing “intensity” for an existing process. If increasing the mixing intensity doesn’t change blending and possibly other results, then mixing may not be the primary problem. Making changes to mixing based on subjective information rather than on an understanding of how mixing is likely to affect both the process and the results is risky. Always remember that you can’t solve inconsistency problems without making changes — but that the appropriate alterations may not necessarily involve just mixing. DAVID S. DICKEY is senior consultant for MixTech, Inc., Coppell, Texas. E-mail him at d.dickey@mixtech.com.